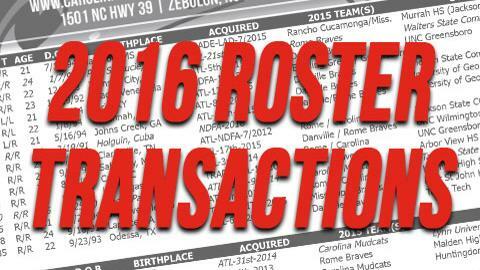 ZEBULON, NC - The Atlanta Braves announced several player transactions today with two affecting the Carolina Mudcats active roster. The roster moves included the release of RHP Andrew Thurman from the Atlanta Braves organization and the activation of RHP Chad Sobotka off the Carolina disabled list. The Mudcats roster is currently at 25 active players with three disabled and one temporarily inactive. 8/18 - RHP Andrew Thurman released by Atlanta Braves. 8/18 - RHP Chad Sobotka activated off Carolina disabled list.